Two decades ago, the dominant waste hauling companies began a highly successful campaign to persuade cities to adopt a system in which all recyclables were commingled and deposited in a single cart. Single-stream recycling collection systems proved very profitable to these companies. And after they mechanized sorting at supersized processing facilities, or materials recycling facilities (MRFs), the higher capital costs resulted in a further consolidation of the waste business. This single-stream collection, practiced on a mega scale, dramatically increased contamination, reduced the quality of recycled materials and undermined a vibrant small-business-based collection and remanufacturing system that had evolved over the previous generation. The Chinese embargo on contaminated recyclables has provided a much-needed wake-up call to cities and recyclers that we’ve redesigned our waste handling systems into ones that profit monopolies and undermine the citizen involvement that for more than a generation has been the driving force toward expanding recycling. We need to assess and understand the injuries we’ve inflicted on ourselves and fashion a system that enables and encourages increased recycling while also nurturing an economic ecosystem that maximizes the benefit to local economies. David Bornstein’s opinion piece in the New York Times has happily stimulated a healthy dialogue among recyclers. (The Conflict of Interest That is Killing Recycling, August 15, 2018). The key takeaway is that a critical activity such as recycling in U.S. cities should not be entrusted to consolidated companies whose main business is landfilling and incinerating garbage. This is an obvious conflict of interest that has been the focus of attention in the grassroots recycling movement for quite a while. Recycling is less than 10 percent of these companies’ business and is less profitable than waste disposal. Landfilling and incineration can yield super profits. Wall Street has consistently warned Big Waste that recycling cuts into its bottom line. It’s not that single stream cannot work. It can, if scale and ownership issues are planned and implemented correctly. In Boulder, Colo., Eco-Cycle operates a 200 ton-per-day MRF that adequately processes materials to meet market specifications. Materials are clean and prices are good. Similarly in the Twin Cities, Minn., Eureka Recycling operates a 300 ton-per-day MRF with a processing cost within the industry range of $50 to $75 per ton. Independent MRF operators can improve operations. Eureka’s ongoing research shows that compaction rates in collection vehicles can impact the amount of residuals generated. (Residuals are materials that are rejected as non-recyclable at MRFs.) The higher the vehicle compaction rates, the more residuals. We need to separate recycling collection and processing from garbage collection and disposal practices. Federal solid waste management regulations – spurred by growing environmental consciousness in the 1960s – gave rise to new landfill regulations in the 1970s and early 1980s. These regulations favored well capitalized companies, which could afford the plastic linings and leachate and methane recovery technologies that local governments and small landfill owners could not. (Leachate is the liquid that drains or leaches from a landfill.) The implementation of Subtitle D landfill regulations resulted in the closure of small community landfills, from 10,000 in 1980 to just over 6,000 in 1990 and fewer than 2,000 in 2000. The environmental movement fought for safer landfills with strong containment to prevent water, air, and land contamination. However, consolidated companies benefited from weaker and more ineffective liner requirements than originally proposed. Leachate collection methods that were unaffordable to local governments resulted in a tighter grip by these companies over waste disposal throughout the country. Now, four garbage-hauling firms hold at least 50 percent of the national market for solid waste management, and an even higher share in local markets, which allows them to dominate the market pricing. In addition, they influence and often determine local and national policies. These consolidated companies make much more money through landfilling and incinerating than recycling, with higher service fees for garbage collection and lower disposal costs through volume consolidation. In addition, they consistently fight to keep the waste stream large by fighting disposal bans for yard debris and by displaying how recycling doesn’t work: The public can’t be trained, the markets are unreliable, the processing costs too much, and more excuses, displaying their lack of interest in recycling. Any threat to market share of waste volumes is a direct threat to their bottom line and their value to stockholders, which is necessary to obtain capital for further consolidation of the industry. Recycling emerged because citizens organized. They changed the rules and triggered mandatory recycling and incentives for recycling. The consolidated companies by default (and with reluctance) became the largest recycling companies in the country. They added curbside recycling to their services in order to maintain lucrative contracts for waste collection, transfer, and disposal in landfills and incinerators. Recycling was an escape valve for cities to avoid the grip the consolidators had on waste. Logically, Big Waste started obtaining material recovery facilities (MRFs). Eureka Recycling in Minnesota had the prescience to see this, and in 2001 built their own MRF with capital provided by their end use markets. This control over processing capacity allowed Eureka to expand from Saint Paul to Minneapolis and to offer quality recycling services at a reasonable price. Many cities cannot escape so easily. Big Waste now controls about half of the estimated 200 MRFs operating in the U.S.
Cities were lobbied and persuaded to close down locally owned dual-stream processors and send their recyclables miles away for processing at oversized mega MRFs. The introduction of single stream in Washington, D.C., was supposed to boost recycling rates, but they have remained flat for over 10 years. This shift costs the District of Columbia about $500,000 annually in unneeded transportation expenses. A viable minority-owned dual-stream processing company, with 25 jobs, ceased operating. In Chattanooga, Tenn., single stream doomed the Orange Grove recycling facility that provided jobs for individuals with challenges. Big Waste introduced single stream for mass recycling, treating recyclables with the same equipment as garbage disposal. The quality of recyclables did not matter as much as quantities, as companies were paid by the ton for collecting and processing. Sloppy processing was the norm given offshore global markets accepted poorly sorted material and paid very low wages to workers to further sort. China made this “solution” – increase your recycling rate by 40 percent, but get recyclables with 40 percent contamination that have to go to landfill – possible by accepting contaminated materials for two decades. The low-quality overseas shipments to China abruptly stopped in 2018, although China had warned the U.S. about coming changes years earlier. Big Waste did not make any adjustments. In late 2017, they pleaded for delays in implementing restrictive policies. None came. In reaction to the restricted global markets, Big Waste now has raised prices up to $120 per ton to process a city’s recyclables, because markets for contaminated recyclables have dropped. 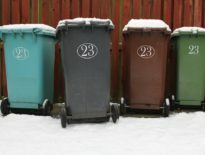 Professional recycling and waste managers as well as grassroots recyclers have known the score since the onset of the recycling movement in the late 1960s. Single-stream recycling is stifling recycling in major U.S. cities, such as Baltimore, Boston, Dallas/Fort Worth, D.C., Detroit, Houston, Indianapolis, and Philadelphia, which all have recycling rates that are about half the national average of 35 percent. These stagnant recycling cities are held back from properly recycling. These cities are restricted in applying new, creative ways to engage residents and businesses in recycling or reuse of materials such as home furnishings, glass, textiles, books, and organics. 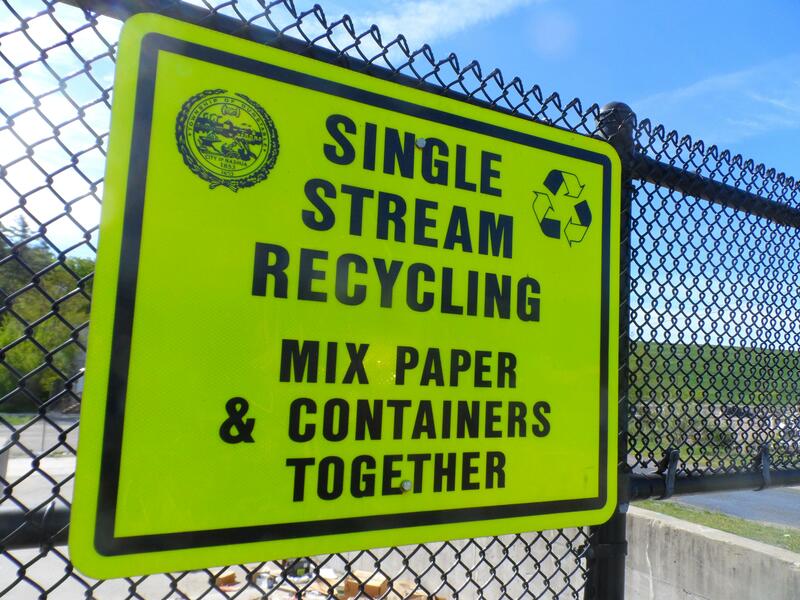 Oft overlooked, dual-stream and curb-sort recycling improve recovery with less contamination than single-stream collection, and are also educational tools. Single-stream recycling has given households another garbage can, only this one is contaminated with recyclables that have to be recovered through ever more expensive MRF technology. The companies that control the whole system, operating for their own interests and profits, operate the single-stream systems. This business model raises prices an estimated 30 percent above normal competitive prices, according to some analysts. In addition, there are the opportunity costs that cities and the private sector pay for not having a reliable clean stream of materials as an economic base. Citizens and business taxpayers need transparency. Where is their material going? There are relatively simple solutions to the waste problem. There are local decisions that can offer economic and ethical recovery of recyclables. Don’t panic. The sky is not falling. Recycling markets have seen deeper drops in past years than we are now experiencing, and have recovered. But the days of sloppy recycling should be over. Markets all over the world covet U.S. recyclables, as long as quality standards can be met and verified. U.S. processors and manufacturers are setting up shop to utilize American-generated recycled paper and plastic. The materials will be processed here in the States, and recycled fiber and pellets can be sent to Asian manufacturing markets. Even as recycling costs have increased in this interim period, note that disposal costs of these materials at landfills and incinerators can be much higher. In Baltimore, with low recycling markets in 2017, it cost $20 per ton to recycle but $50 per ton to incinerate. In Vermont, where tip fees at MRFs have increased, the actual cost per household per month will rise just $0.65. Bring citizens organizing on this issue into the local planning process. Citizens have made the difference in every jurisdiction that has a successful recycling program. Use local and state bonds for recycling economic development infrastructure. Do not wait for federal government funding. Addressing local infrastructure includes considering revitalized transfer stations, compost sites, resource recovery industrial parks, reuse enterprise centers; plus undertaking administrative tasks such as zoning, rate setting, and franchise fairness. Teach how to properly recycle and compost and the realities of waste disposal in all schools, including information about job and career opportunities in this $70 billion sector of the U.S. economy. Reduce the waste stream by 20 to 40 percent in a hurry. Meter garbage through unit pricing or pay-as-you-throw (PAYT) fees for household waste collection. PAYT results are proven to be quite dramatic: Doubling the recycling rate in one year, reducing overall waste by up to 40 percent. More than 10,000 towns and cities in the U.S. now use this system. 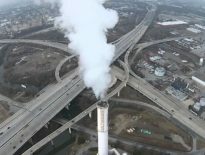 Worcester, Mass., has used it since 1993, and has saved $10 million in avoided incineration costs. Clean up sloppy recycling. Recycle right through quality collection and quality processing to yield quality end-use markets. Consider reverting to dual stream. If not a conversion, scale the facility properly to focus on quality over quantity. Single stream, with public education, can operate with quality output, if conveyors are slowed to allow for quality control. Process materials (single stream or dual stream) in town, with proper scale and ownership arrangements. Reduce the carbon footprint and transportation costs, while generating jobs locally. Contract directly with end users and require reliable and transparent processing and marketing. Consider franchising as an option for commercial waste collection and recycling only if small and mid-sized companies are treated fairly, and if employee pay and working conditions are given proper consideration. Mandate waste reduction through local ordinances that ban single use food service packaging and other products through campaigns at the local and state level. U.S. food processors will green their packaging due to consumer pressure. Encourage state governments to tax packaging that is hard to reuse, recycle, or compost. This will end the laissez-faire approach to new plastic packaging and bring design under environmental standardization. We can’t recycle our way out of a plastic ocean and plastic world without changing wasteful distribution of non-recoverable packaging. Develop taxing mechanisms on waste through landfill and incineration surcharges. Use the generated tax funds to pay off municipal recycling bonds. Also, establish Recycling Investment Trust funds for investors to support local recycling economic development. In short, the actions China has taken do not ring the death knell for U.S. recycling — far from it. Rather, it’s an opportunity for our cities to realize the full potential of appropriate, sustainable, and circular development, creating wealth from within the local recycling system. Neil Seldman is director of the Waste to Wealth Initiative at the Institute for Local Self-Reliance and was instrumental in founding ILSR, National Recycling Coalition, Grass Roots Recycling Network, Zero Waste International Alliance, and the Save the Albatross Coalition. Bob Gedert is the former director of the Department of Resource Recovery, Austin, Texas and that city’s Zero Waste program, and the Immediate Past President of the National Recycling Coalition. “These companies bought heavily into a capital-intensive collection system called ‘single stream’ that mixes everything before it gets unloaded into an automated material recovery facility. More high-tech machinery then tries to separate the mixed-up materials into marketable resource flows, but irreversible damage has already been done. Wall Street-financed technophiles love single stream, but their job-killing system encourages people to think anything is okay to put into the bin.” See http://ilsr.org/waste-management-misleading-recycling/. For further analysis of how to improve single stream processing see Susan Kinsella and Richard Gwertman, Single Stream Best Practices Manual and Implementation Guide, January 2007; published at http://conservatree.org/learn/SolidWaste/bestpractices.shtml. Peter Anderson, Center for a Competitive Waste Industry, “Endgame! Consolidation and Competition in the Waste Industry,” MSW Management, June, 2000; and Peter Anderson, et alia, The Impact of Waste Industry Consolidation on Recycling, MSW management, June 2001. Transparency Bill drafted by World Reduction Resources, http://www.arkleg.state.ar.us/assembly/2013/2013R/Bills/HR1043.pdf. Brenda Platt and Colton Fagundes, Yes! In My Back Yard: A Home Composting Guide for Local Government, https://ilsr.org/yimby-compost/.